I have worked in the oil and gas sector my entire adult life, since I graduated university (10 years ago). 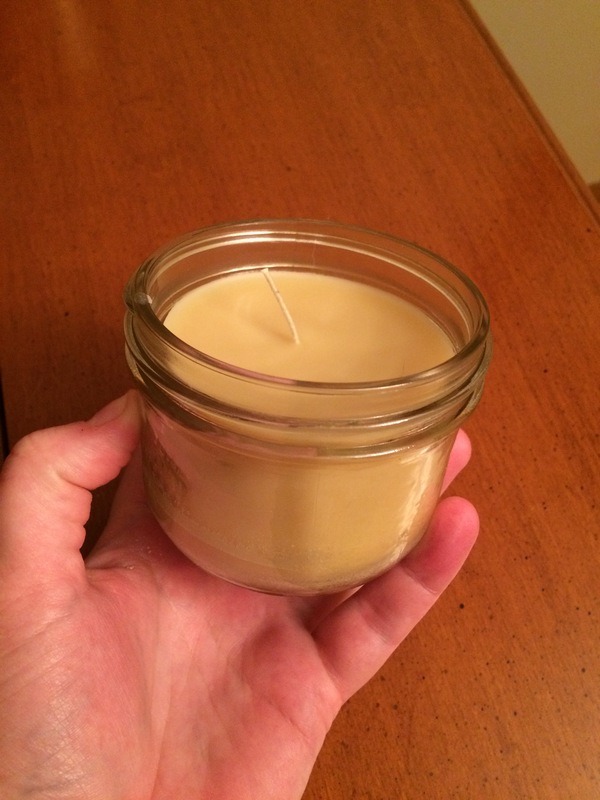 We all know that oil is down right now, and my company made the decision to downsize. I was one of the people that was laid off, as I played an administrative role and was not a necessity like an engineer or I.T. I was very upset with this, I was losing my pay, my benefits and my work friends. My boss wrote me a very nice recommendation letter to give to future employers during an interview (which I was grateful for). A lot of my family members were pushing me to go get a similar job and stay in the corporate world. However, I just couldn’t bring myself to do it, I had other plans! For years I have thought to myself that I wish I could spend more time with kids and more time building my Homestead. 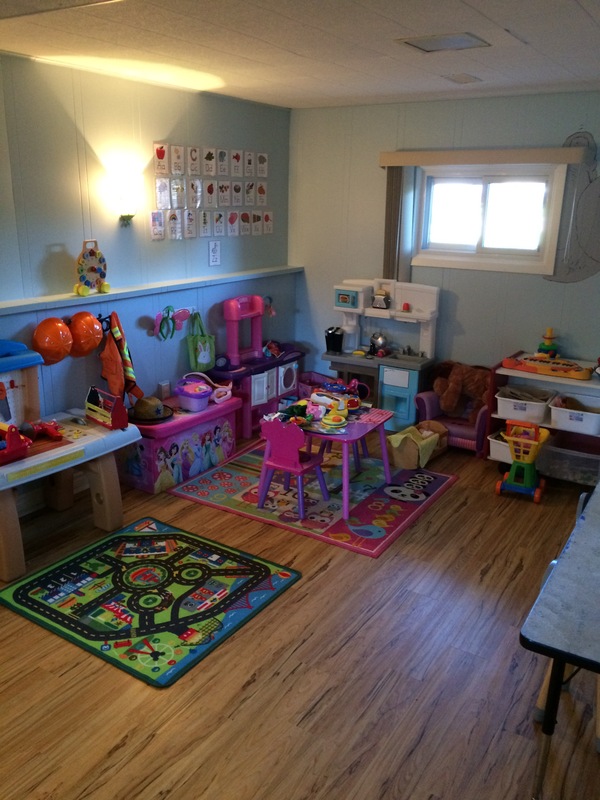 So, I have made the decision to open a home daycare. There are pros and cons to all the decisions we make in life, but I felt the pros outweighed the cons! I am so excited to be employed by self, and I pray it is busy enough to pay the bills! Time will tell! Sometimes when one door closes, another one opens! Yesterday my family went out and harvested most of the remaining carrots and some of the cabbage that was ready to pick! We got quite the haul! Yesterday was a true testament to the importance of letting your kids play outside and including them in homesteading chores:Sunday morning was brutal! My 4 year old and three year old were fighting all morning. Arguing over toys, books, anything! They were yelling at each other, tattling etc. I was trying to get some house work done but I thought I better get them outside and playing, maybe that would decrease the tension. I brought them outside, gave them their gardening gloves and away we went. For 2 full hours they did not argue one time. They were laughing together, helping me pick and wash carrots! They gathered all the carrot stems up and fed the bunnies, chickens and quail. It was like a peace and calming washed over the whole family. Not that a homesteading life will always be rainbows and butterflies, but I believe that afternoon was a true testament to the importance of giving children age appropriate tasks and responsibilities. This is the type of ‘education’ they will never receive in school. It is one that generations past always gifted their children. We as a society have to get back to teaching our own kids how to garden, cook, forage, animal husbandry etc. If we don’t do it no one will, can you imagine a society where no one knew how to do any of these things? It’s a scary thought. Most of the carrots I peeled, chopped, blanched for 3 minutes and then froze them in ziplock baggies for use in a nice fall time soup! The rest I left dirty, unpeeled, in a brown paper bag in the fridge for use later this week. I am going to cook them with a nice pork roast. The cabbages I cut into quarters and blanched for a few minutes and they went into the freezer as well! What’s Happening around the Homestead? Hello Everyone! 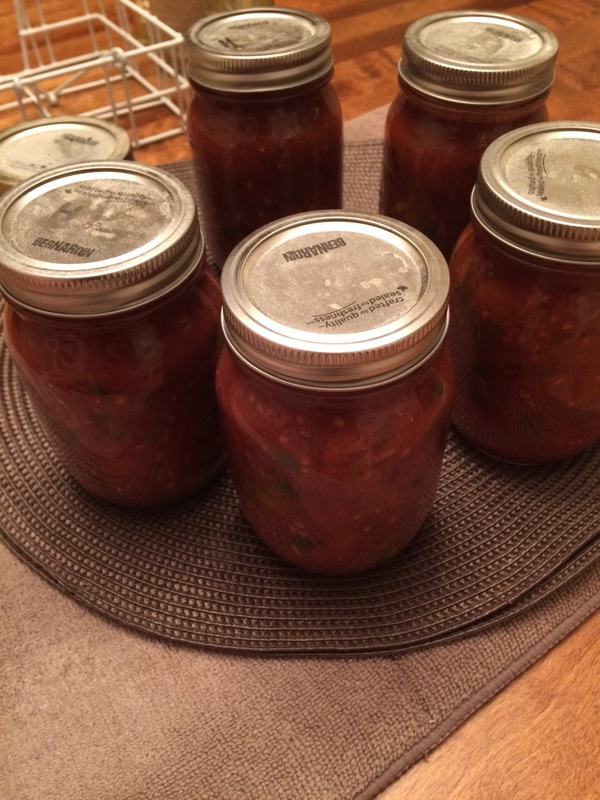 I haven’t posted in a bit, it has been a very busy but productive month!The gardens are really producing, the quails and chickens are working hard producing eggs, and I have been canning away! I was going to post a few pictures of what has been going on around the homestead and talk about each one a bit! I calculated the size of my lot and thought I would share it with you. I have approximately 1/6th of an acre, which isn’t huge, but you can do so much with a yard of that size. You have to be smart and use permaculture principles to make it work though! That’s one thing I have learned in the last couple years, do what you can with what you have! I would love to have 5 acres out in the country and have a “farm” but that is not in the cards for my family right now, so I have to be patient and live how I want to live with what I have! 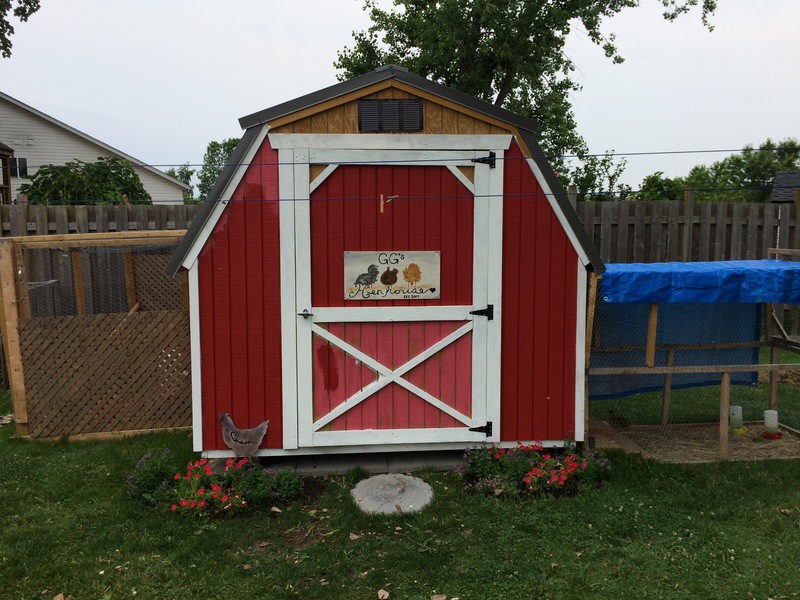 This is a picture of our ‘barn’ that houses the chickens and quail. A lot of sites say not to house them together, but I have had them together for about 5 months now and have had no issues. They have separate living areas and are not directly interacting with each other. We built separate runs for them on opposite side of the barn. Back of barn is sectioned off for chickens, right side for quail! I have Americauna and Wheaten Maran chickens. They both lay an egg about every other day, sometimes two days in a row. 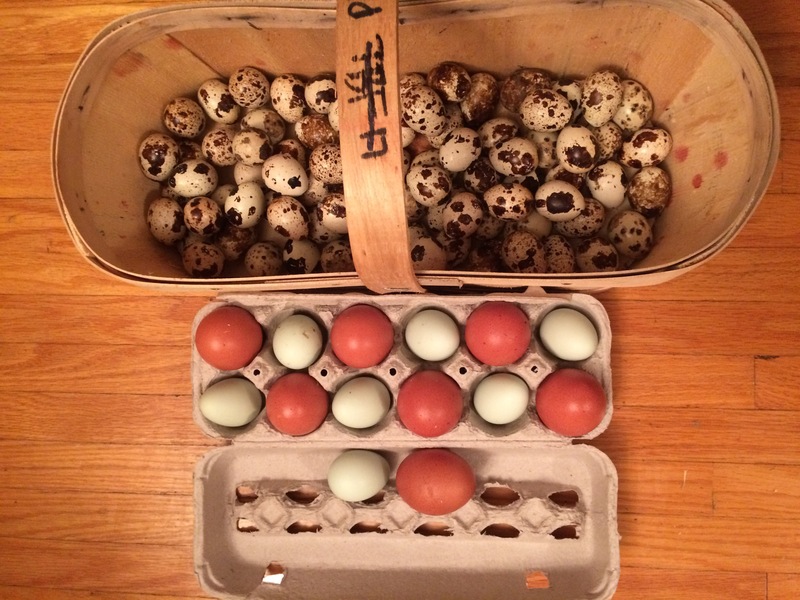 The Marans have beautiful dark brown eggs, and the Americaunas have a blueish-green egg! The quails lay every single day, they are egg machines! 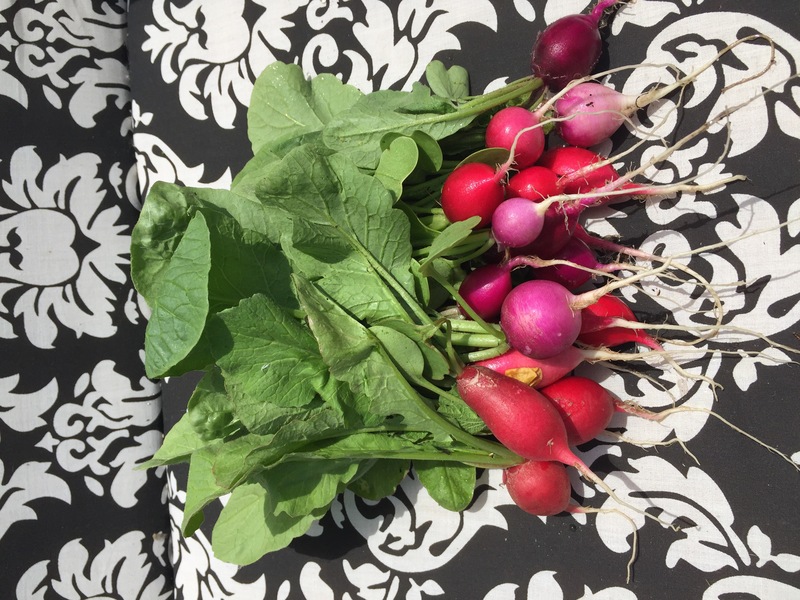 So far this year the garden has been pretty productive! 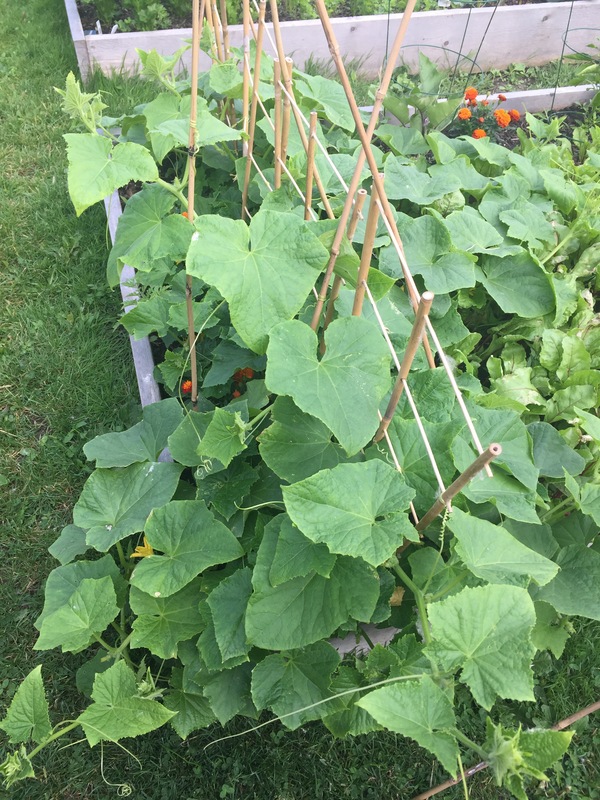 We had a TON of cucumber and zucchini, the peppers are growing really well right now and we are finally starting to get some tomatoes! 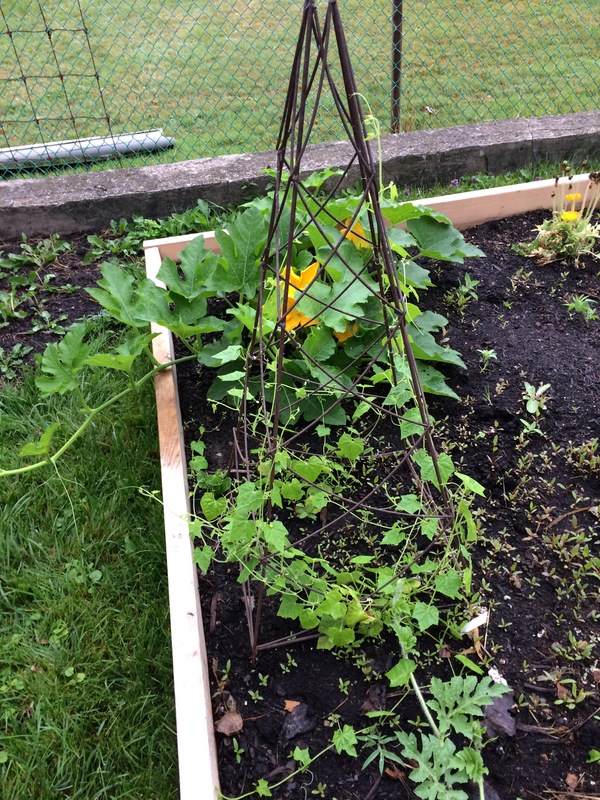 The one garden bed has powdery mildew unfortunately, so that may really hurt my watermelon, pumpkin and squash! I made a spray which was water, a tbsp. of baking soda and some dish soap, and that seemed to help a bit. We grew some cucamelons this year, which was fun! They look like tiny little watermelon but taste like cucumbers. 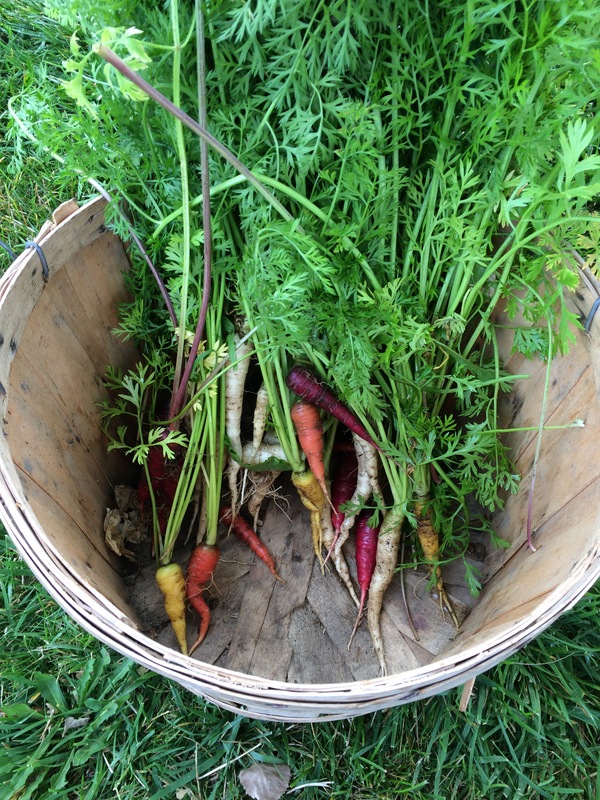 We are harvesting carrot and beets right now. 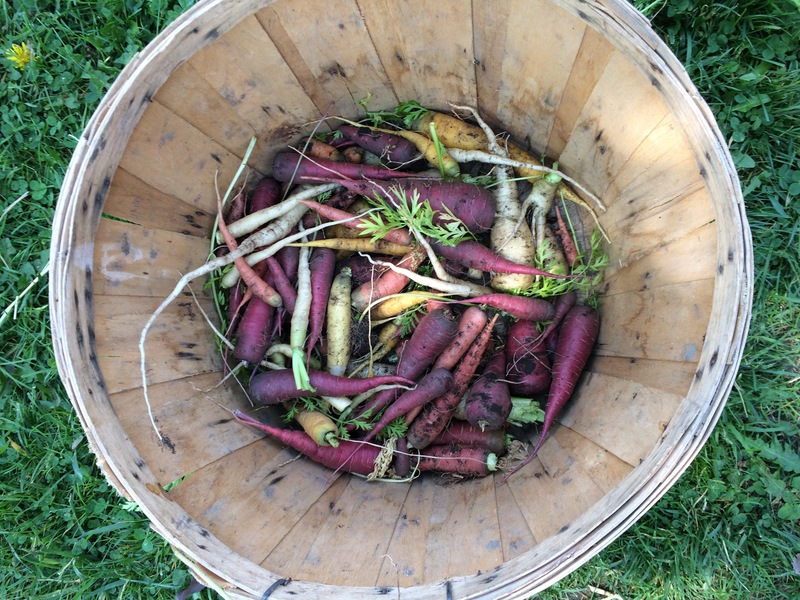 The carrots we have been eating as we go, and I canned up some pickled beets, YUM! 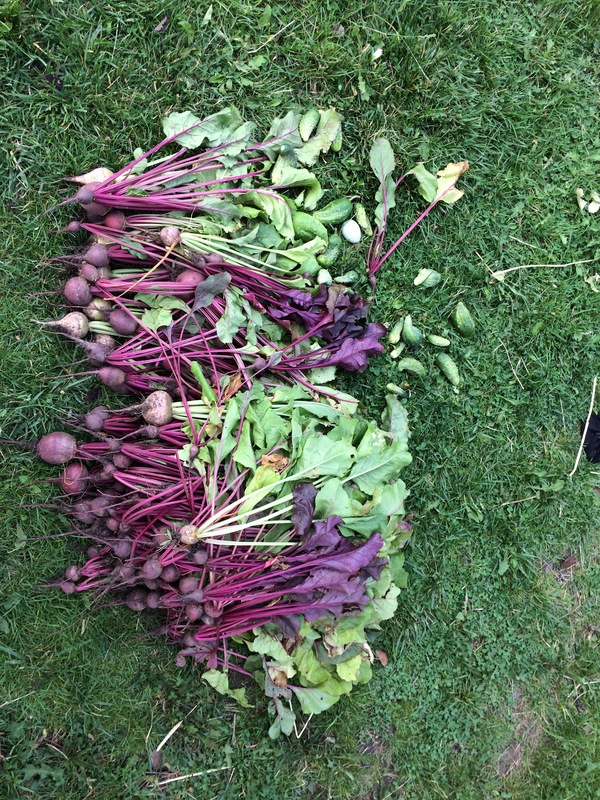 Beets! Some are puny! 😂 but so taste-y! Store bought carrots do not even compare to fresh picked, these are crunchy, sweet and delicious! Cucamelons growing up a trellis, they have since taken over the whole thing! Thanks for stopping in to listen to my ramblings! Hope everyone is having a great summer! Post some pics of your garden or homesteading ventures in the comments! 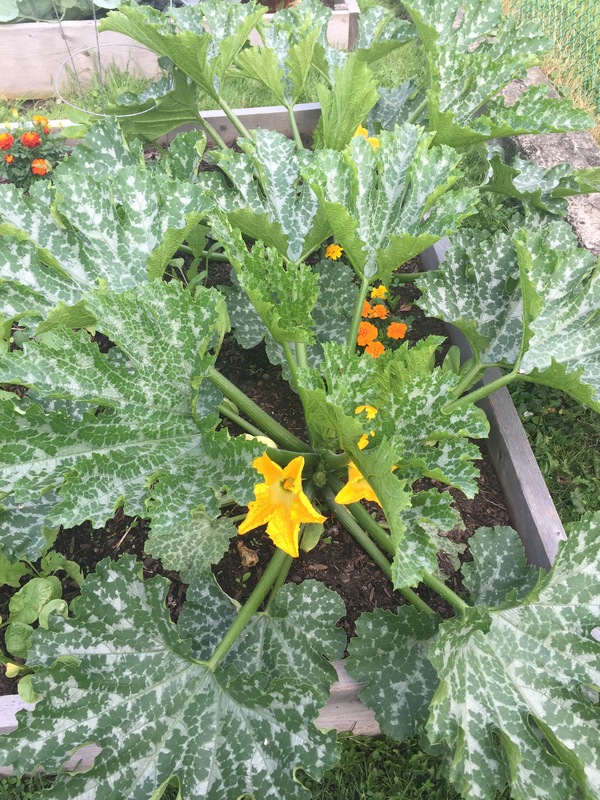 My neighbor, who is approximately 85, and grew up in Italy came over and gave me some advice about my zucchinis. When she talks to me about vegetables, I listen. She knows her stuff, to say the least. She told me to pick the zucchini when it is the length of your elbow to your wrist and thinner than your arm. She said in the case of zucchini (and cucumbers) bigger is not better! She used the term ‘woody.’ When they get so big, they taste woody – which I am assuming is not a good flavor LOL! I will be taking her advice, and not letting them get too big! The leaves are enormous!! They almost look prehistoric! I love eating zucchini on the grill with some olive oil and salt and pepper, get some good grill marks on them. 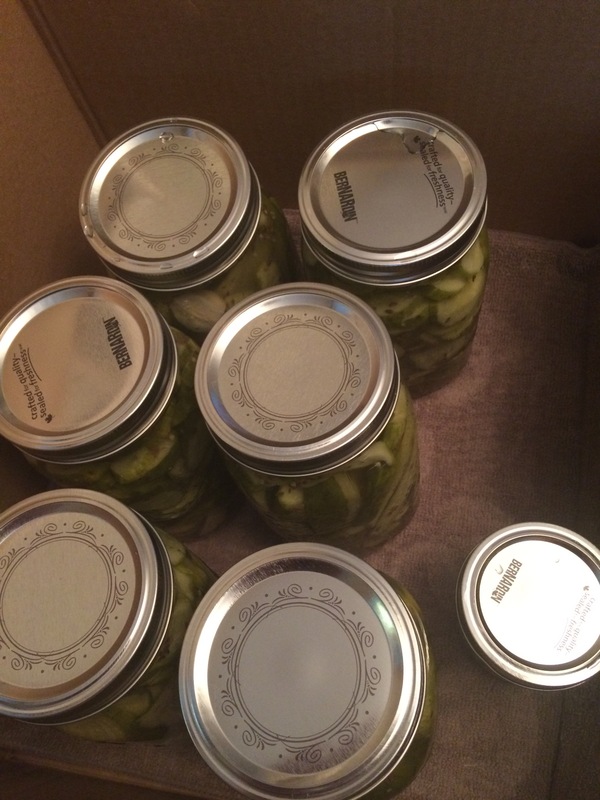 I chose to grow pickling cucumbers this year and will be making pickles (future post to come with recipe included). 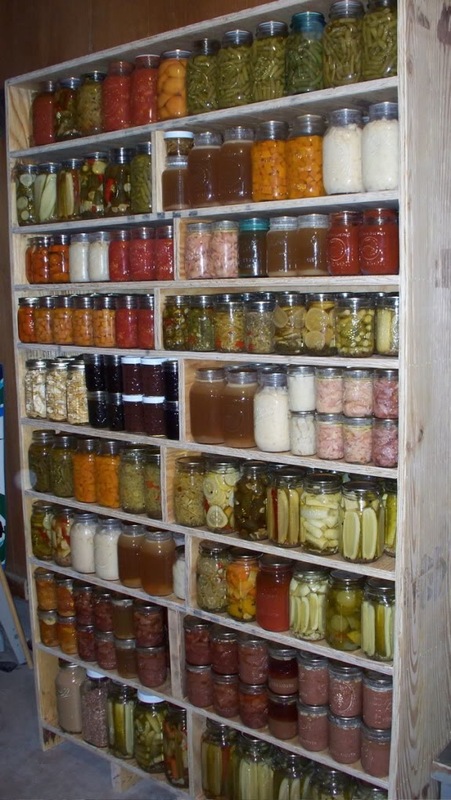 My family goes through JARS of pickles so I will also be buying some bushels from the local farmers market. 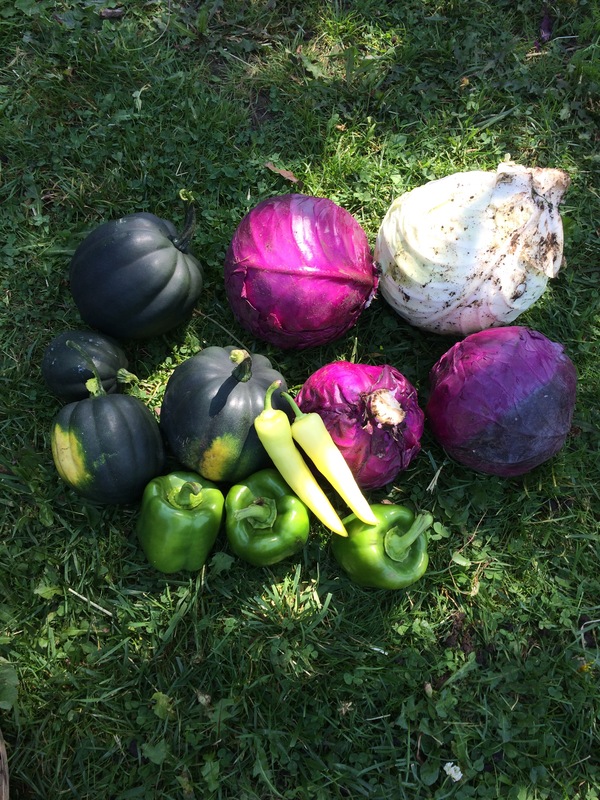 I am hoping as the years go on to be able to rely less and less on outside sources for my vegetable needs. However, I definitely love supporting local farmers. I am almost passionate about it, you could say. I know how hard they work to make a living, and I would rather see my money go right into their pocket instead of Walmart’s. I have no problem bringing $60+ to the market on Saturday morning and spending every last cent on veggies. I love talking to the farmers, getting tips from them! They are a wealth of knowledge, and they are dwindling in numbers. We need to tap into this knowledge, and support them directly! As one of my favorite farmers, Joel Salatin would say “Don’t you find it odd that people put more work into choosing their mechanic or house contractor than they will into choosing the person that grows their food?” Powerful words. Good morning! 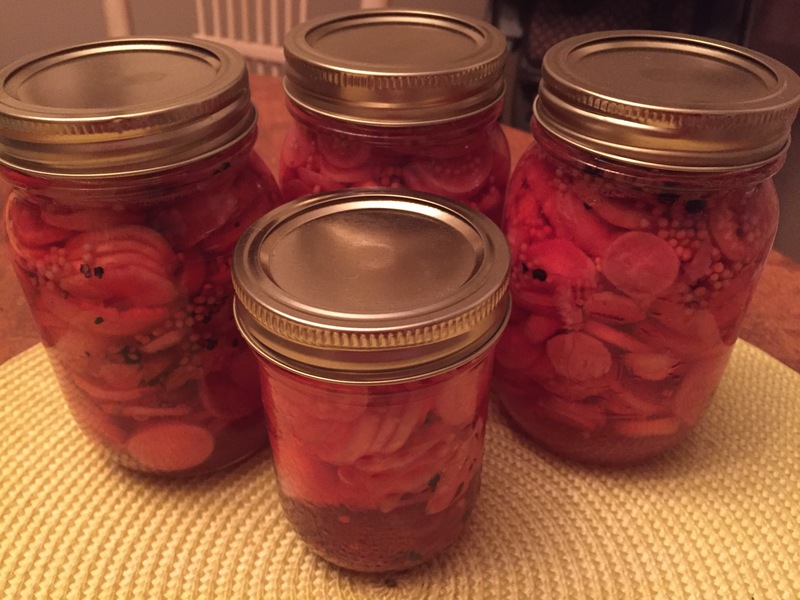 Last weekend I canned some pickled radish, and they are delicious! They are great for a salad, adding a little zing to a taco, wrap or burger. The possibilities are endless! I got the recipe from this website…http://www.foodpreserving.org/2012/05/day-9-pickled-radish-slices.html?m=1 they have lots of great canning recipes! My hard work! This little bit took two hours to can! 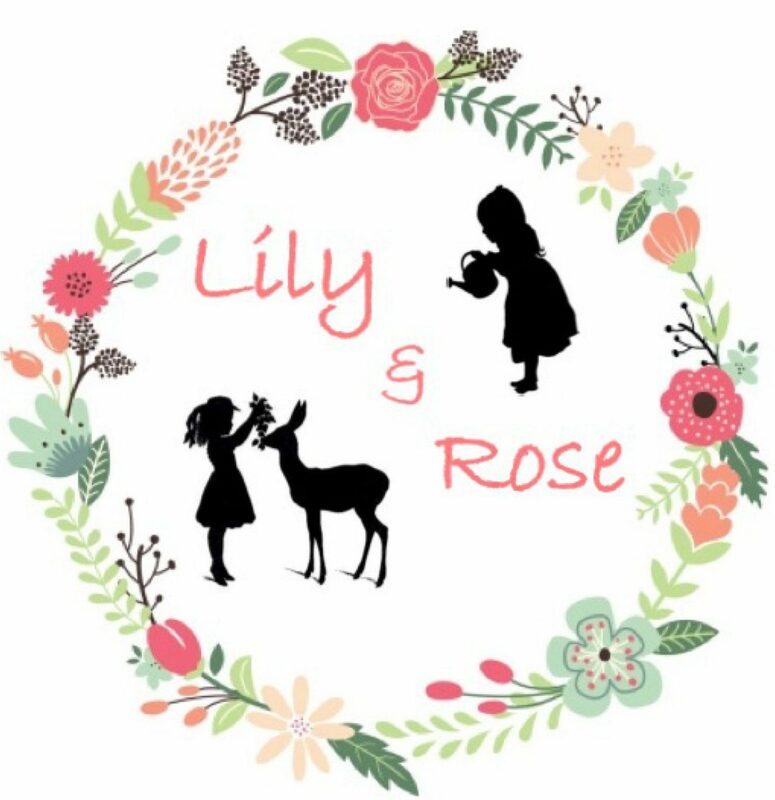 – I now make my own laundry detergent, cleaning products, body butter, chap stick, candles, body scrub, essential oil perfume etc. 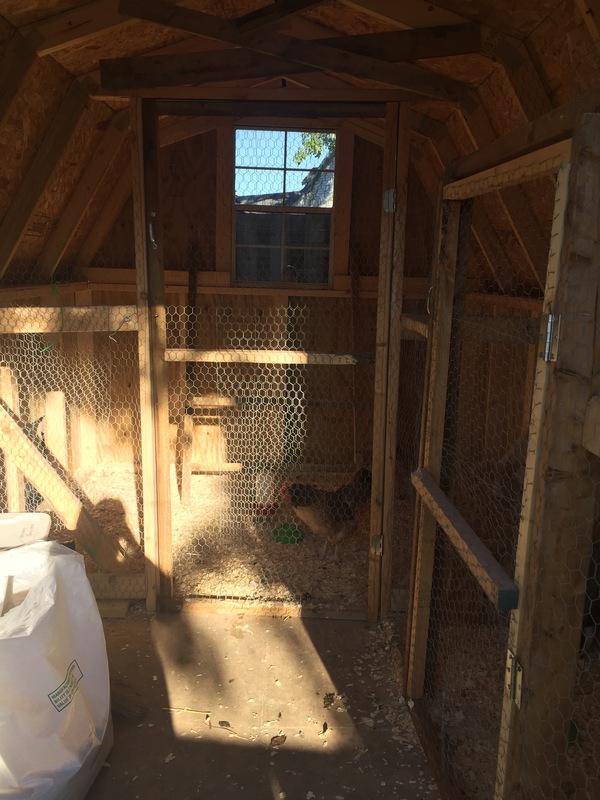 – Animal husbandry: chickens, quail, and bunnies (we have rescue bunnies as pets, not meat rabbits) I do use their poop for fertilizer, so they do contribute! One struggle that I have encountered is that my ‘housekeeping’ has suffered a bit in this process. I now have so many things to do outside, watering, weeding, feeding animals, cleaning coops and hutches, that I have noticed the inside has taken a backseat a bit. I have to learn to give myself some grace sometimes. When you are raising young children and working, now with the added outdoor duties, you have to learn to prioritize. That has been a learning curve for me. I am working on it every day. Eve Kilcher from the show ‘Alaska the Last Frontier.’ She is an amazing homestead women. She has skills that would blow your mind. Watching her is extremely inspiring, they live off the land and between her and her husband Eivin, and they provide almost 100% of the food they eat. They grow enormous gardens, hunt, fish, and raise their own animals for eggs, milk, and bees for honey. It really is an amazing shows to watch and learn from. Another role model is actually a friend of mine who owns a 7 acre horse farm. They board horses, raise and breed chickens and geese, grow food, preserve, bake etc. Surrounding yourself with likeminded people is so important, because you will encounter people that think what you are doing is weird, and they won’t understand. People will say, “but why would you bake bread when you can buy it at the store?” or “Eggs are 2 bucks a dozen at Walmart ya know.” So being part of internet communities and finding people in your area that have the same passions will motivate you to keep going! Leading a more simple life isn’t ‘easy’ but it’s definitely worth it! It is so important to get your kids involved in all aspects of homestead life. That is how they learn, by doing. 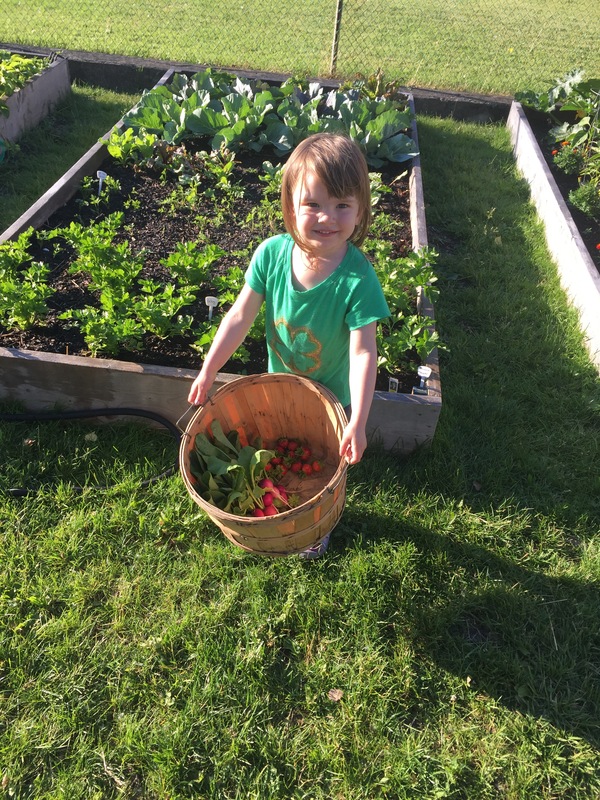 Today we harvested radishes and strawberries and my girls were so happy to be helping me, and got right in there and starting pulling them out of the soil (watch out though, radishes have prickly leaves!). They helped me wash them, and put them all in the basket and carried them in the house. 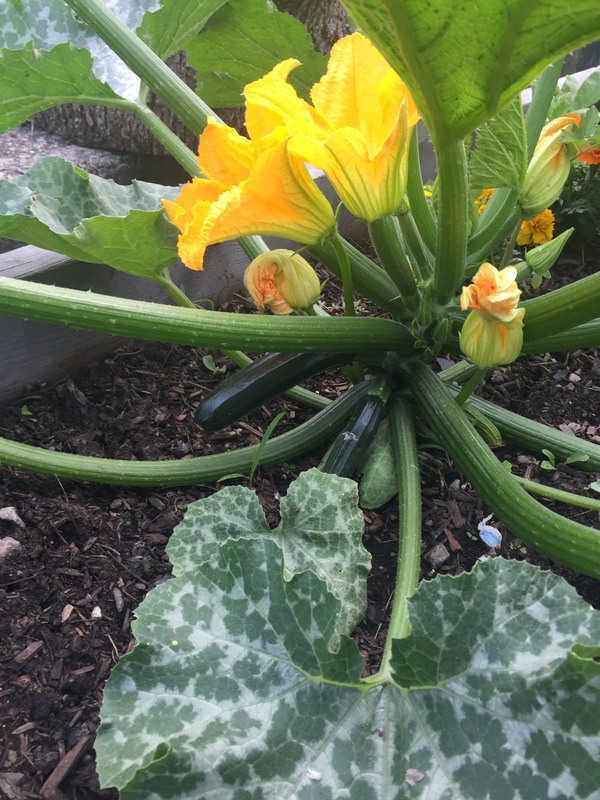 The excitement they get from counting the zucchinis that are on each plant, to watching the flowers on the cucumber vine bloom. 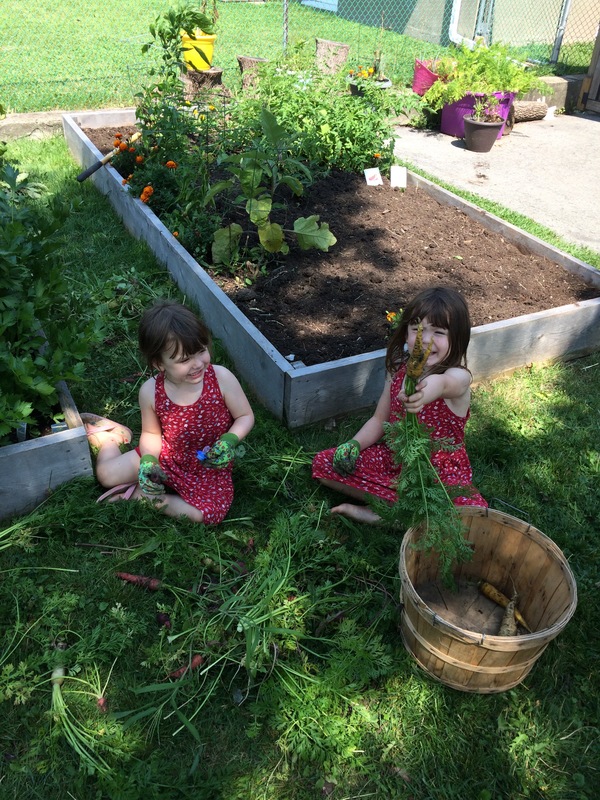 It really is wonderful to see their passion for gardening at such a young age. I wish I could have triple the amount of garden space that I have, I would love to grow 70-80% of our vegetable intake. However, I work 40 hours a week, with a ½ hr commute each way. So I know at this time it is not possible and that I have to be thankful that I am able to tend to the garden that I have. It is important to stay within your means and not overwhelm yourself. It is tempting to want to jump right in with two feet, but you WILL tire yourself out that way. Adding to your homestead should be slow and steady. Test the boundaries of what you can handle and stay within them. 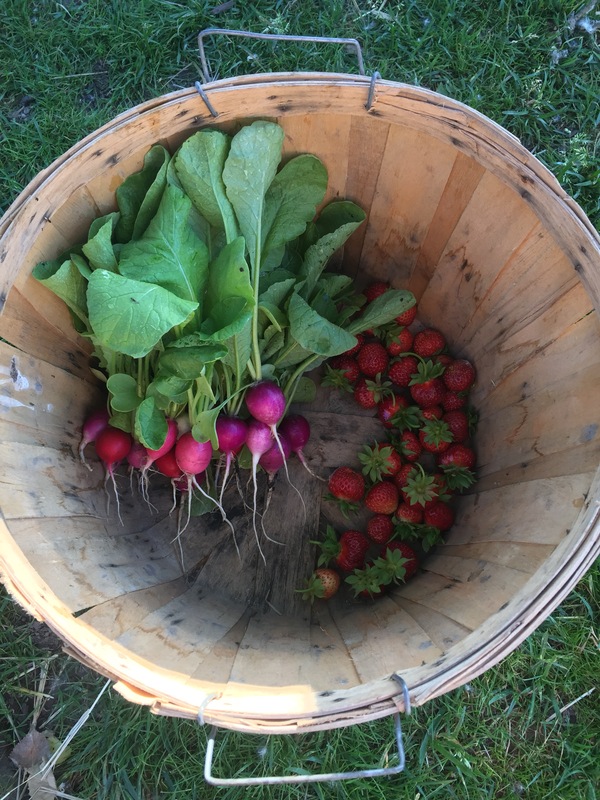 The strawberries have already been eaten, and the radishes are going to be pickled! I will be doing a post on that, and sharing the delicious recipe with you also!